Crane operation is now a lucrative industry. Thousands of professionals across the country are now entering the industry to become a full-time operator and work on projects throughout Canada. And with Canada’s real estate market growing at an exponential rate, the need for crane operators is only going to continue to rise, providing great prospects for those who become crane operators in the future. In this latest post, we take a look at the steps required to become a crane operator. Before entering into a position as a crane operator, it’s important to know the differences between the two main types of operator positions. There are positions in which an operator will be positioned on a stationary crane at a construction site, and positions in which the operator will be responsible for a mobile crane, which is attached to a vehicle and delivered to the worksite. Gaining a high school diploma and completing courses such as English to a high grade level will show companies the operator has a clear understanding on communication and can be entrusted to complete quality work. Crane operators may also be required to have completed mathematics to a high grade level, as calculations are frequently required during operation. Operators are also required to complete an accredited training program recognized within their province. Crane operator training typically takes six-to-eight weeks and combines hands-on training work with in-class exercises to provide the student with a full introduction to the position and its requirements. Mobile crane operators can achieve a “Red Seal” designation, which is recognized by all provinces and allows the student to work across Canada upon completion. Each type of crane has its own licensing exam, which must then be passed for the operator to become fully qualified. 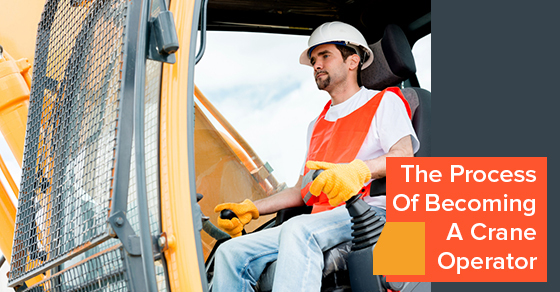 Each province has a minimum grade that must be achieved to gain a crane operator license and so it’s important to check the grading requirements within the province to determine how to move forward from the examination. By gaining certification and becoming a qualified crane operator, you can then begin a lucrative career that will ensure you have employment opportunities throughout the country! To discover more on the process of becoming a crane operator, call our team today!